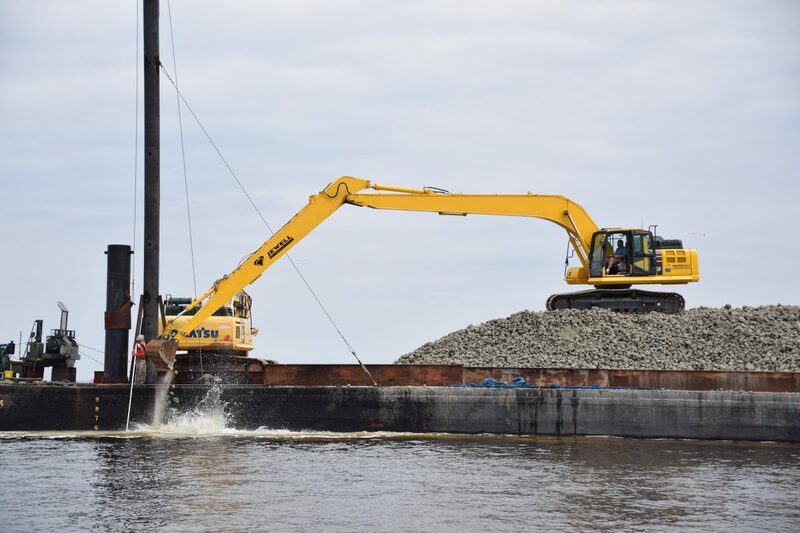 The North Carolina Coastal Federation’s major project supporting the 50 Million Oyster Initiative is the Swan Island Oyster Sanctuary. These acres are part of Senator Jean Preston Marine Oyster Sanctuary. This sanctuary is located in the Pamlico Sound near the mouth of the Neuse River. 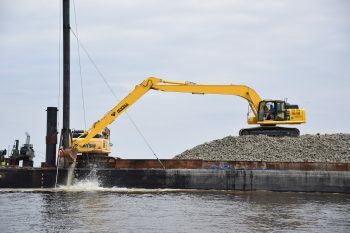 The first 15 acres of the project were constructed with limestone marl — which was purchased from a North Carolina quarry — that was been stockpiled at the North Carolina Division of Marine Fisheries’ South River facility in Carteret County. 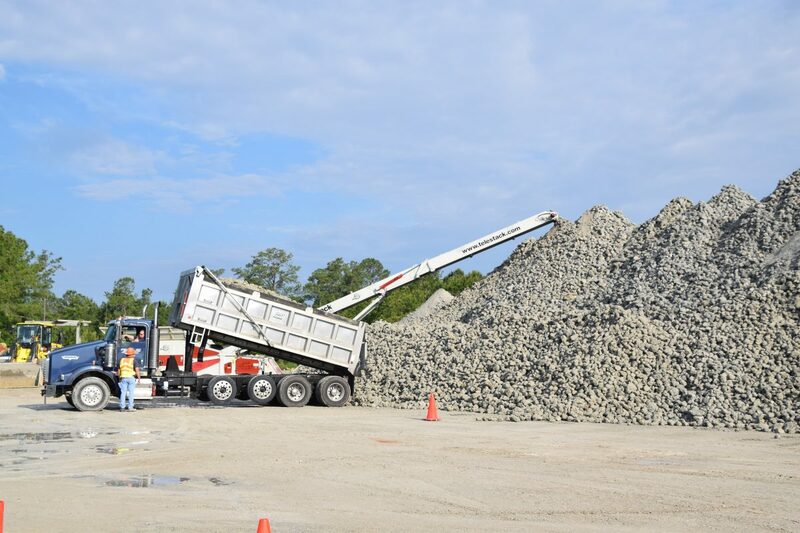 The 10 acres constructed in 2018 were built with granite. Near the oyster sanctuary, DMF will be planting cultch. These cultch sites will provide a place for spat — baby oysters — to land and grow. Cultch sites will be open to harvest once oysters reach harvest size at 2-3 inches. The cultch sites and oyster sanctuary work together to create an interconnected network of oyster reefs. 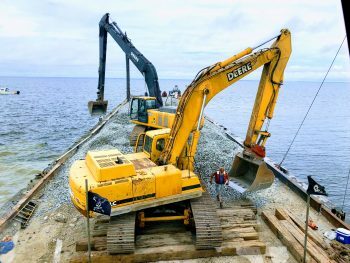 A wide range of jobs are supported by this project, including private contractors, construction workers, scientists, university researchers, state agency employees and fishermen. Approximately 25,000 tons of limestone marl were used for the first stage of the project. 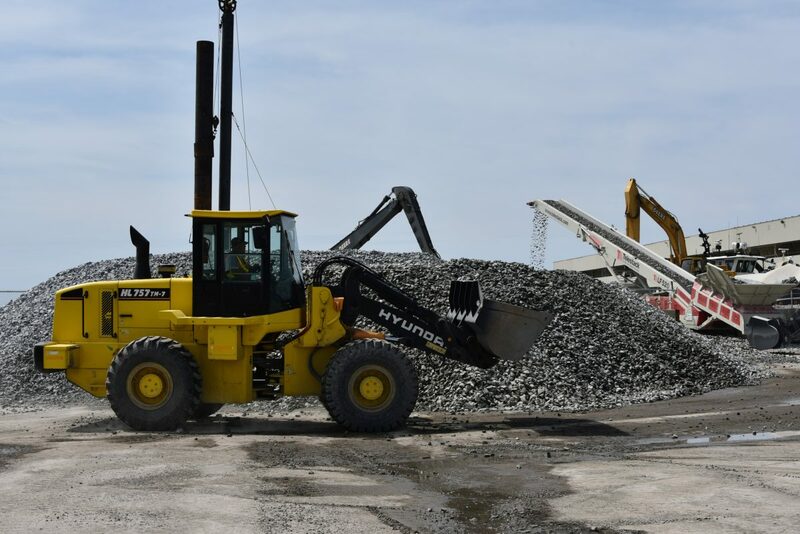 It took about 1,200 tractor trailer loads to bring the material to the South River facility, and each barge load holds 1,000 tons of material. Watch a video of a deployment. 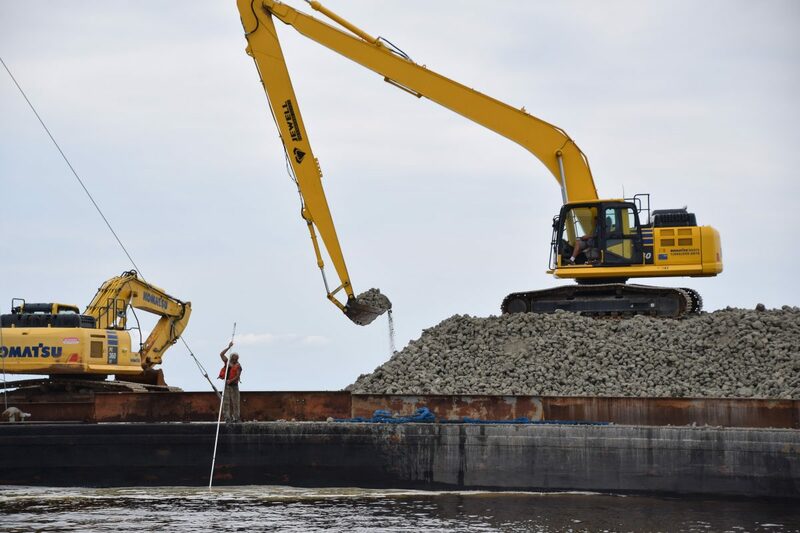 Fifteen acres of oyster sanctuary were constructed, supporting approximately 15 million oysters. 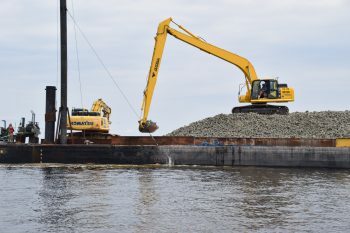 Ten acres of oyster sanctuary were added to the project site. Constructed started May 11 and wrapped up at the end of June. Through support from a NOAA grant and the General Assembly, project partners plan to increase the sanctuary site to almost 40 acres in 2019. 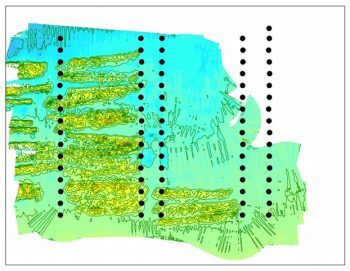 Read a handout about the Swan Island Oyster Sanctuary. The Division of Marine Fisheries took this image of the ongoing work at the Swan Island Oyster Sanctuary using sidescan mapping equipment in 2018. 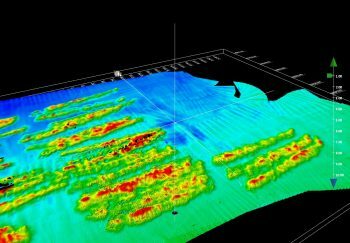 The Division of Marine Fisheries took this image of the ongoing work at the Swan Island Oyster Sanctuary using bathymetric mapping equipment in 2018. An overhead view of excavators deploying granite at the sanctuary site. Excavators at the North Carolina Port at Morehead City load granite from the port onto the barge. It takes the barge 6-8 hours to get to the project site. 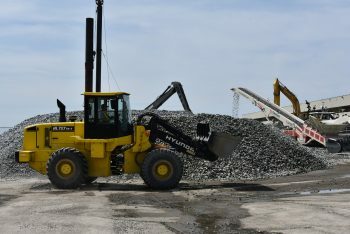 Approximately 18,000 to 19,000 tons of limestone marl are stockpiled at the North Carolina Division of Marine Fisheries’ South River facility. Truckloads of material are still coming in. Photo by Mark Hibbs. 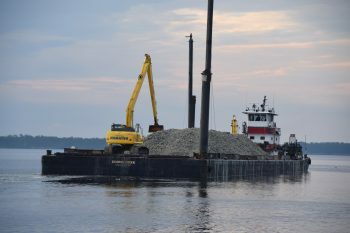 The barge departs the South River facility on May 3 on its way to the Swan Island Oyster Sanctuary Site in Pamlico Sound. Photo by Mark Hibbs. 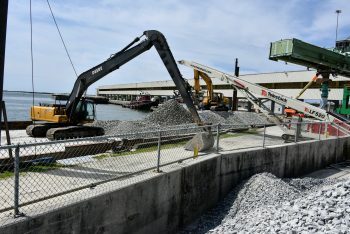 Crew deploy the material from the barge into the sound. Each barge-load holds about 1,000 tons of limestone marl. Photo by Mark Hibbs. The limestone marl is used to create ridges that are about 4 feet high and 6 to 8 feet wide. 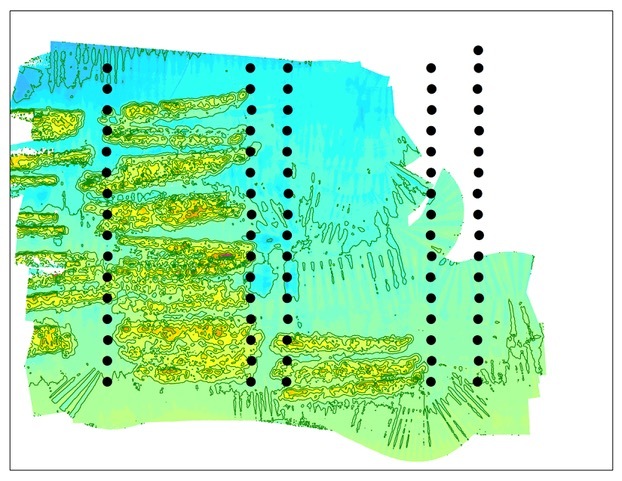 The ridges must be at least 6 feet below the surface. Photo by Mark Hibbs. Construction on the sanctuary is expected to wrap up in mid-July. It takes a day to load the barge and a day to deploy the materials. Weather can also impact whether or not the barge goes out. Photo by Mark Hibbs.